As we move on from the Two and enter the Three we appear to have arrived just in time for a party or celebration of some sort. Laughter, music and a buzz of lively chatter assail our senses. As we look around, our eyes are drawn to three women dancing in a circle. They are involved in a toast of some kind for they raise their Cups high above each other’s head. They appear to be the centre of attention and all eyes are focussed on them. One of these ladies or possibly all three obviously have cause to celebrate. The women dance in a circle and we can see the faces of all but one. Two of them have dressed their hair up with flowers while the other has left her hair flow loose. This lady appears different from the rest. As they dance they are surrounded by the fruits of harvest time. Bunches of grapes, pumpkins and apples lie strewn about the dance floor. This appears to be harvest time or the fruits of their labour and it looks like all the hard work has yielded well. There seems to be an abundance of fruit and vegetables. So much so that the women wear them in their hair and carry them while they dance. The Three of Cups brings, celebration, festivity and socialising. Much joviality and merriment is suggested. The Empress (III) of The Major Arcana presides over such occasions. This card brings families and friends together to celebrate the joy, happiness or success of one of their own. It is definitely party-time all round. So what might be the reason for such as gathering? Could it be that the couple in The Two has decided to make their relationship official? Are we at an engagement party or a wedding? This card is strongly feminine, so these women may be enjoying the bride to be’s last night as a single woman as they dance and party the night away at her Hen Do. One thing is for certain, these women know each other well and appear to be having a great time. Then again it may be that the group has something to celebrate. They toast each other’s success and notice how the Three Cups form an upright triangle. Something has grown and developed well. They may have joined forces to work on a project which has been immensely successful or perhaps they have won an award for something they have created. There is a tendency towards excess with the Three of Cups and these women must be careful not to overdo it. If they are not careful, along with the fun and gaiety, they may become intoxicated with too much alcohol. Parties and drinking may be a very strong feature in their lives but let us leave that more so to the reversed aspect of this card. For the time being, let them enjoy the party and hope they do not feel too hungover in the morning. The Three of Cups is a very positive card for friendship and women’s gatherings or group. The Empress (III) of The Major Arcana strongly influences this Three and could very possibly be the organiser behind all the festivities. However, even though it is a strongly feminine card it can also represent male friendship and bonding. It highlights the importance of friends in your life and the need to get together occasionally. It is a positive card for growth and development in these areas and a good sign that you are enjoying yourself. Along with the tendency to excess in the Three of Cups there is another not so nice aspect to this card which thankfully only rears its head when it reverses. Note the clothing the women wear. One woman is dressed completely in red suggesting that she may indeed be the driving force behind their success or celebration. Even her undergarments are red. This indicates a very ambitious person, who could get ruthless should things go wrong. The woman dressed in white with the over-gown of orange or yellow suggests that she too is fired with enthusiasm and eagerness. However, she is genuinely warm and joyous. Her undergarment of white suggests that at the end of the day her heart is always in the right place and she operates on pure motives and with good intent. The woman dressed in white is totally innocent and possible quite naive. She is part of and included in this group because it suits the situation at present and she may be of some use. However, that could easily change at any time. We will explore this further in the Reversed Three of Cups. The Three of Cups is also known as the Feast or Famine or Multiple Choice Card. It’s party time when the Three of Cups appears in a reading. Put your glad rags on and get your hair done because you are going to a celebration of some sort where there will be lots of people you know and some you may not have seen for a long time. It is going to be a great time to chat and catch up with old friends and family members. Depending on surrounding cards, an engagement party, wedding celebration, or plain old family re-union may be indicated. Perhaps it is a christening or graduation. Whatever the cause for such festivities, there will be plenty of food, drink, music and dance. Party-time is here, and for some, possibly too much partying!! With this card there is a tendency to over indulge in the good stuff so go easy on the food and drink. Hangovers and exhaustion accompany this card. 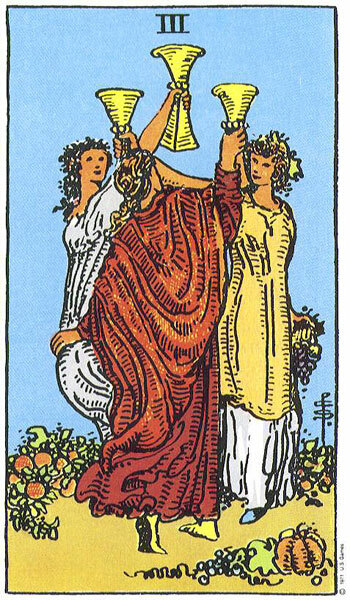 The Three of Cups refers strongly to women’s groups or meetings with women. You may be attending a Hen Night, Debutante’s Ball, School Re-Union or just having a Girl’s Night in. It suggests that friends and their support figure strongly in your life at the moment and it looks like you are having a right old good time. This card urges you to find joy in others and to deliberately seek out friendly company. Surround yourself with people who make you happy. Remember to be kind and supportive to your friends too and make an effort to meet up regularly. In a relationship spread The Three of Cups can suggest an engagement or wedding, depending on surrounding cards. It is a time of great growth and happiness between a couple and a sign that your relationship is really developing. There may be a need to share this joy with others. As a couple you may have something very important and exciting to celebrate as pregnancy can be suggested by this card. It can suggest a third person in a relationship and when upright this third person is welcome. Look to surrounding cards in the spread for other pregnancy related cards or if a Page falls alongside it. You will learn about these cards as we go through the lessons. The Three of Cups can also suggest that you and your partner are attending many engagement and wedding celebrations as one by one your friends begin to tie the knot. You will definitely enjoy yourself but be careful not to overdo it. All this socialising and intoxication may have a negative effect on your own relationship. The Multiple Choice or Feast or Famine aspect of this card could find you moving from a period of drought in your love-life to having several potential partners to choose from all at the one time. If there has been a separation or falling out between partners the Three of Cups can symbolise a happy re-union. However, surrounding cards would need to back this up. In a career reading the Three of Cups suggests a close team working well together. There could be a celebration after a successful launch or the completion of a project that involved team-work. The team members each bring their own expertise to the work place leaving little room for competition or bitching. If you are thinking of taking a job offer or moving to a new career, then The Three of Cups suggests it would be emotionally beneficial. You stand a very good chance of being happy with your choice as the company has great growth potential and staff enjoy coming to work each day. If you have been searching unsuccessfully for a job or placement then the appearance of the Three of Cups could indicate that you will get several offers all at the one time which you must choose from. With the party aspect of this card, it can highlight working as an Event/Banqueting Manager, Wedding Co-ordinator or Entertainer. Obviously this card can represent the typical ‘Office Party’. Enjoy your self, for you have worked hard for this treat but do not let yourself down or make a show of yourself by getting drunk and messy. Remember not to say anything to the boss with drink on you that you would not dream of saying to him when sober. Holiday time and no work for a while! When the Three of Cups reverses it can suggest that either you have no time for friends and socialising or you are overdoing it altogether. Commitments and work overload could leave very little room for gaiety and fun. It could represent a time when friends lose touch or just grow apart. However, it may just indicate that sad and deflated time when friends and family part to go their separate ways after a reunion, wedding or the Christmas holidays etc. You may also feel that you have nothing to celebrate and feel down and depressed. You might be fed up being the bridesmaid all the time and never the bride. You may feel you get invited nowhere. The negative aspect of The Reversed Three of Cups can be seen or experienced when groups of women turn sour or nasty. There may be gossip or scandal circulating about you from people you would have thought better of. There may be cliques and groups that you feel left out of. This may be on your part, or a deliberate attempt by others to exclude you. Rather than being happy for your success, this group of women may toast you but be green with envy behind it all. Cattiness may abound or there may be an enemy disguised as a friend. You are possibly being very naive about those who appear close to you. Can you trust your friends? The ‘Mean Girls’ syndrome may be evident. Eating disorders, drinking and addictions may be an issue when The Three of Cups reverses or you may have eventually sobered up and now feel disgusted with your behaviour and those around you. You might be attempting to detox and clean up your act and this may entail distancing yourself from your regular boozing buddies to go cold turkey. The constant rounds of parties and socialising may have left you feeling exhausted and disillusioned so action must be taken. In a relationship the happiness of the Upright Couple seen in the Two disappears and a halt is called to the party. This reversed Three of Cups can suggest a failed romance. Shock, tears and great unhappiness may be evident. Celebrations turn to commiseration as engagements break or marriages fail. This is bound to cause a great scandal among friends and family. There could be inappropriate behaviour at a wedding. Too much drink may have been involved and someone may have done or said something they shouldn’t have. It may be enough to cause a huge rift between the newly weds. The break-up may not be straight forward either. Check for other cards such as the 7 of Swords, The Moon, Reversed Knight of Cups or any other reversed Court Card as an affair may be suggested here or an interfering third-party trying to cause trouble in the relationship. It may even be your best friend. Beware the woman dressed in red. She will be ruthless in getting what she wants. She may be after your partner or indeed already involved with him. She may be an interfering mother, sister or friend out to cause trouble or break you up. Note that the faces of the other two women can be clearly seen but the woman in red has her back to us so we really can’t tell what her face is showing. She may very well be hiding her true motives. This woman may have a hidden agenda. If that is you in white, you won’t see it coming as she will be all sweetness and light to your face. On the other hand, it may be you who is the scarlet woman. Promiscuity and affairs accompany this reversed Cup card. Too much drinking and over-indulging may be causing problems and lack of support in your relationship when the Three of Cups reverses. It can also indicate a short-lived relationship. Termination or miscarriage can be represented by this reversed Three. You must look to surrounding cards for further evidence. In relation to careers, a team may not be working together as they choose to work against each other to serve their own purpose. A position with no growth potential or prospects for promotion. This reversed card can suggest a highly competitive work environment where you must watch your back constantly. Sly underhand behaviour, gossiping and bad mouthing each other may be the daily routine at your place of work. There may be an enemy or spy in the camp poisoning others. When the Three of Cups reverses you may feel that you have no career options and that there is little to choose from on the employment front. You may get little or no response to your job applications. A project could fail due to lack of team-work and effort. You may lose an award to the competition. Someone may take credit for your work. The Three of Cups reversed can simply represent that time when we must return to work after holidays or the festive season. The carefree days are over and we must settle back into a routine of alarm clocks and early nights. On the other hand you may be burning the candle at both ends; working hard and playing equally so. You may have developed a habit of falling into work smelling off stale alcohol and wearing yesterday’s clothes. ***When we next visit the Cups in Card 4 we will see if the celebration is continuing or not. Yes, yes, yes, this is what I want to hear because this is what I hope to convey in my teaching. Not just flat meanings for the cards but rather stories and anecdotes as you say. You will remember a story far longer than you will a list. Keep up the good work and thanks for the lovely feedback. Lots of good information here. I tend not to see the intoxication side of this and I wonder if it’s because of my point of view or because that has not really applied yet in a reading I have done. An interesting viewpoint though. Hi William, thank you for your comment. 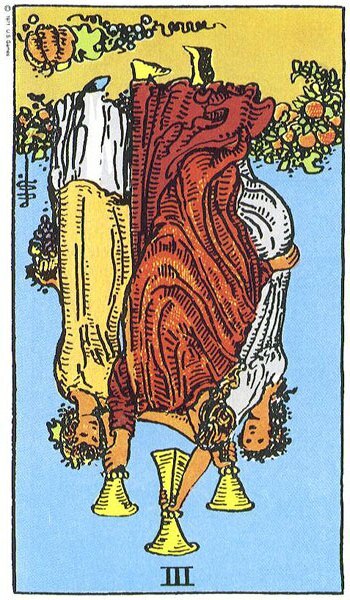 The intoxication element is mostly connected with the Reversed aspect of The Three of Cups as it can be deemed as over-indulgence. In the Upright they celebrate and toast each other’s success or friends gather for merriment. It gets a little out of control when in Reverse. It does not always mean intoxication as this is only one of its associations. Hello, Vivian! I hope your holidays were happy and safe as mine were. I have a writing idea my gut is telling me to go with, so I asked the cards if writing and publishing my writing would make me a lot of money and I received the Three of Cups upright. As clarification, I asked the cards if this was a ‘yes’ in answer to my question and pulled The Sun upright. Does this sound positive to you? Oh creatively these cards suggest success and much to celebrate. If you set the intention for financial success then these are very positive cards but The Three of Cups and The Sun would be insisting on more than wanting financial rewards. You must love what you do too. I think at this stage you know that writing is the way to go for you so stop thinking and do. However, do not rely on cards alone to impress you. Cards only offer potential. You still have to put in the work. Writing will give you the freedom you seek. Thank you, thank you. IS it your own subconscious that gives you the answers through the cards or is it other entities like the spirit board, because if it’s the later, and I think it may be, I may have to throw them out. I like using them, but I feel my energy is waning. Sound strange? Lyle, I don’t use any spirit boards or entities, just my own subconscious. If that is what you are using then I would highly recommend you stop. You have been referring to the individual cards and I helping with interpretation on the basis that you are simply shuffling and drawing, not using a board of some sort for guidance. If you have been using a board then all your readings have been tainted. I have to go now but maybe you could explain better to me how you are using tarot? No, No. I’m not using spirit guides or boards, I was just wondering how the Tarot received answers. I believe I’m giving my power away. That’s why I wanted to know if it were being taken. My own will has become weakened. I still love the Tarot, maybe a bit too much and just need a break. Hi Lyle, sorry I had to go out earlier. I think I may have mentioned it to you in an earlier message that you should not be consulting the cards too often on every issue in your life. Neither should you rely 100% on their accuracy as you can place too much stock on how the cards fall. This can lead to disillusionment and also inaction. You must do what you think is best for you and not rely on cards, psychics or mediums to tell you what is going to happen. If you consult too often with tarot, then you can sit forever waiting for the right cards to fall into your lap before you do anything. You must go out and make a success of your own life, with or without the tarot. Your three of cups with the sun suggests that maybe for the moment you would best advised to not fly solo with your writing. 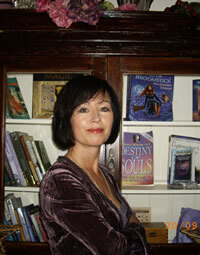 Have you tried doing some guest authoring on group sites that are relevant to the writing you do. Maybe it is in the group environment you will cut your writing teeth and build reputation. Becoming a writer takes time and there are millions of financially strapped writers who work very hard but earn very little. I can vouch for that from experience. The answers from Tarot come from the subconscious, via intuitive interpretation. I am publishing a post tomorrow based on asking my son in the spirit world for messages for the world in 2016. I have stated clearly that even though I have set the intention for his help and guidance, all interpretations are mine. I do not hear voices or see spirit energy. I hope that if my son has something to say, that it comes through my own subconscious and not a separate entity. I am in awe of mediums and psychics who see and hear things all the time, but most often they tell you it is not as clear cut as that. Many people pray and ask for inspiration or guidance. Sometimes we feel divinely guided and a lot of the time we feel on our own. You run a risk of draining your creative energies by trying to force them too much. I would put the tarot away for a while and trust your own gut instincts instead. 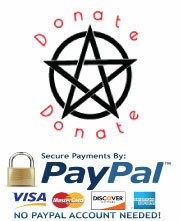 You can always go back to the tarot and you will then find it a far more useful tool. I feel you are so set on a certain outcome, you could easily be forcing the cards to read in a certain way for you. This will not help in the long run. Put the cards a way for while and see what happens without them. I ‘m not sure about the circumstances behind your son’s passing, but you have my condolences to say the least. Have you communicated and received a response from him before? Thanks Lyle. No, I don’t get responses. Just asked for him to guide my subconscious while interpreting certain readings, like the post I will be putting up today, if I ever get the links to work, that is. I wish I was able to communicate with him. The only time I really felt I did was when I went to see a Medium the year after he passed. I think I wrote about it in another post. The things she told me were amazing. Even my little dog who passed away a few months before my son (she was old) came to visit too. The medium asked me why a little black and tan cavalier king charles dog would be running around my feet. I really felt my son communicated with me through this medium. He has popped up at other times when doing a healing on someone or a past life regression. It does not come from me though. It was always the client who would suddenly announce that my son was in the room and wanted to say hello. The clients were stunned when I told them that my son had indeed passed. It was usually clients who had no spiritual training at all, just coming for a healing for their bad back or a past life regression to see if it threw any light on their current life relationships. It was always unexpected.